You’re probably familiar with the fact that wine and whiskey are aged in barrels. But cocktails? 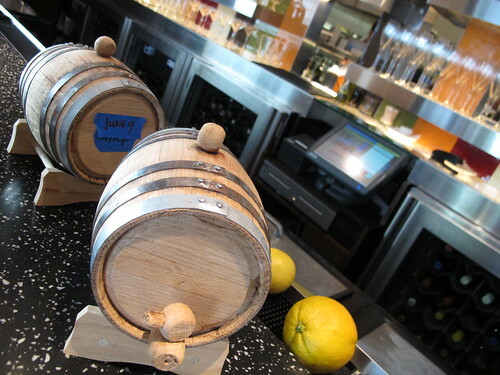 It may seem like a trend, popping up in bars in London, Portland and New York for the past year or so, but it’s actually a much older revival – aging cocktail ingredients in oak barrels was a popular technique back at the turn of the last century. 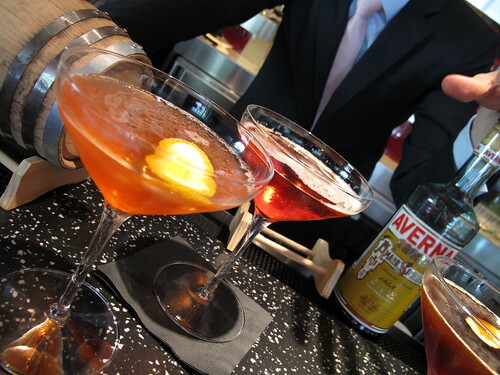 But for Bibiana‘s general manager Francesco Amodeo, it’s not a matter of trend. It’s practical. “I was talking to my mother about their cellar at home,” he tells me, referring to the family home on the Amalfi Coast, “what to do with all the barrels?” His grandfather makes wine, and his mother was looking to get rid of the excess refuse. Francesco jumped at the chance to put them to another use. Starting with two sizes, 1 and 5 liter barrels, he’s crafted two cocktails for Bibiana that were just uncorked for the first time Tuesday evening after three months of aging. As they’re produced in small quantities (at least until Francesco’s grandfather finishes crafting a 250 liter barrel for him) they’ll go fast, so get over to taste them. Aging cocktails gives the liquor a beautiful toasty quality, rounding out the flavor. 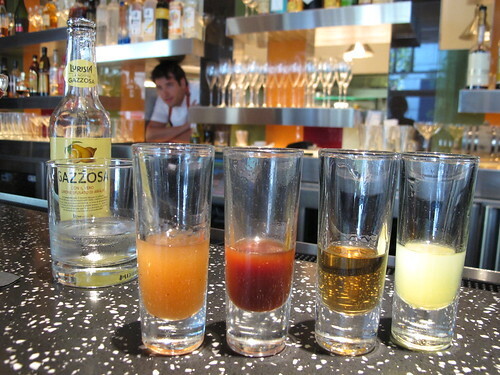 Let’s take a closer look at Francesco’s two drinks and the process. 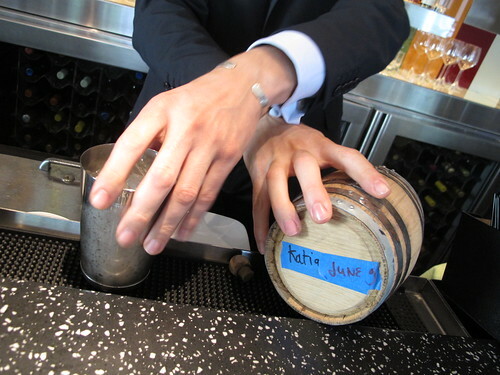 Francesco mixed up two cocktails on June 9th and away they went to age in these perfectly miniature barrels. It’s important that the ingredients are solely liquor-based – for example, if the recipe calls for freshly squeezed fruit or even sparkling wine, you don’t want to add that to the drinks until after the aging process. Also, Francesco advises being careful with liquor that already has a strong smoky quality, as that will intensify in the oak barrel. 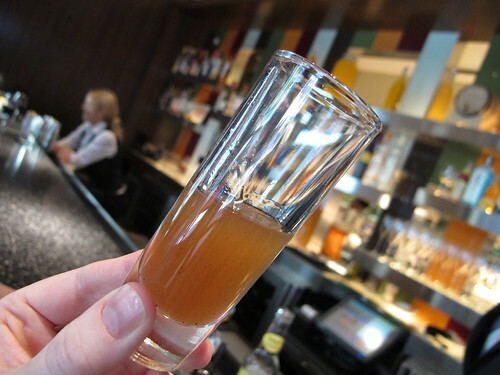 The first aged cocktail that I sampled was the Katia, made with Redemption rye whiskey, Amaro Averna, marasca liqueur and chocolate bitters (those last two made in house). This drink could quite frankly be renamed “Jenn Catnip” as I’m a sucker for Italian digestifs. 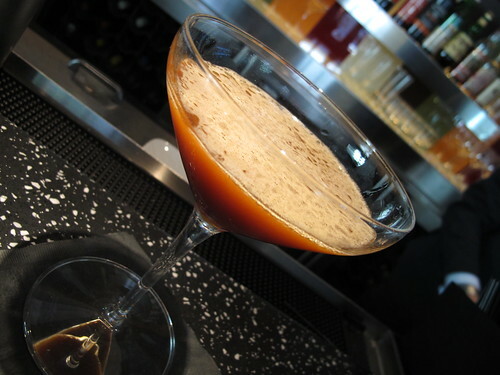 Aging the cocktail resulted in a rich, round caramel taste with the liquid noticeably deeper in color. It’s beautifully complex and definitely meant to be sipped slowly, giving everything an autumnal glow. Next up was the Maddalena, which is a riff on the classic Negroni – the usual trinity of gin, Campari and sweet vermouth were aged three months, and then after uncorking Francesco finished off the drink with prosecco and a lemon peel garnish. Again the flavors seemed smoothed out, mellowed – like the last day of summer after a long beach weekend. Francesco mixed up versions of the two cocktails unaged for comparison, and it was fascinating to see how aging deepens the color and rounds out the taste. “I can make magic,” he quipped, “I am Neapolitan.” Part of the challenge and the fun of making aged cocktails is that Francesco has to look ahead when deciding what drinks to feature – after all, it takes three months before the cocktails are ready, so seasonal forecast is important. When he put down these two it was the height of summer, but the Katia especially makes you ready for fall. As a special lagniappe, Francesco also gave me a little tour of the housemade liquors at Bibiana, which were absolutely delicious – limoncello, walnuts, even biscotti flavored! Something I had never tasted before and went right to my addiction list was the one made of coffee, barley coffee, and over 20 spices. Ridiculously rich and intense, Francesco called it “concerto, like concert,” and I’ll definitely be back to sip some more. The two barrel aged cocktails I sampled Tuesday are available now until the barrels run dry, priced at $16 each. Given the amount of time that goes into their preparation and the fact that they really are sipping drinks, I think that’s a fair cost. After this batch is done, the barrels will be dried out for their next mix. I can’t wait to see what’s next uncorked, in three months when winter’s upon us happy lushes. Bibiana is located at 1100 New York Avenue NW, Washington, DC 20005. Closest Metro stop: Metro Center (Red/Orange/Blue). For more information call 202.216.9555. Great article! 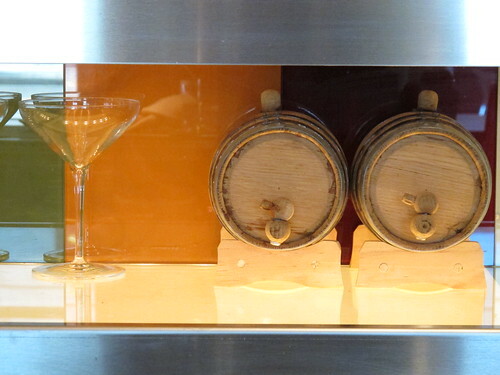 Was under the impression, though, that aging cocktail ingredients in oak barrels was not so much a technique as default at the turn of the last century – barrels were the storage vessel of choice. Anyway, looking forward to trying these and thanks for highlighting them!